But here and there is a truly Venetian pile that comes from the time when “Wealthy as an Argentine” was a byword. The Recoleta cemetery is perhaps the strangest place I have ever seen. This city of the dead contains 60,000 bodies in hundred of mausoleums built like row houses. Perhaps the Via Appia in its heyday gave the same impression, but the Via Appia was not in the best neighborhood in Rome. On the outside of the Greek Revival gate to the cemetery is Requiescant in pace – May they rest in peace.On the inside of the gate (to be viewed by the dead) is Expectamus Dominum – We await the Lord. On the Day of Resurrection this place will be as crowded as the gate the Buenos Aires airport. I sure it will be a cheerful chaos, and I hope, as at the airport, everyone finally makes it. 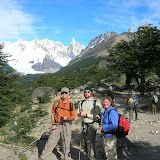 Between El Calafate and El Chaten, the only place to eat is La Leona. The food was surprisingly good, as it was everywhere in Argentina. Dear Drivers and Travelers:Please be informed that on the road between Guer Aike and El Calafte the personnel of civil defense has detected a plague of spiders commonly known as black widows. We therefore recommend that you not get out of your car and much less open the ventilator windows. We pulled up our feet, got in our van, and locked the windows. Because of the horrors that Argentina endured under the military dictatorship in the 1970s, it has a special sympathy for other victims of repression. In the National Cathedral there are two memorials. One is to the Armenian genocide, when the nationalist Turkish government drove out a million men, women, and children to die in the desert, their bones to bleach in the sun. The Turkish government still refuses to acknowledge any responsibility. The second is pages from Jewish prayer books from synagogues destroyed by the Nazis, from the extermination camps, and from the Jewish institutions bombed with great loss of life, in Buenos Aires. Hikers develop an emotional relationship with their boots. They are the difference between a great hike and torture, and sometimes between life and death. Here at the Refugio Chileno in the Torres de Paine I make sure no one has tampered with the boots I had to leave outside while I was getting coffee (instant – ugh! The guidebooks warned us about this unfortunate Chilean taste). Also, to call someone a guanaco is an insult. It means he cannot be domesticated; he spits. Guanacos are a wild member of the llama family. They seem to exist mainly to be eaten by pumas. Our guide had heard that pumas got 90% of guanacos; he found that hard to believe, but suspected that pumas got half of them. Sal, a member of our group and a serious photographer (note the camera), is keeping a resepectful distance from the guanaco. Like llamas and camels, they spit. The gauchos were impressive horseman. They could make their horses walk sideways. One morning they rounded up some mares that were having a great time around the lodge, and the mares did not want to go into the corral. They gauchos walked their mounts sideways and nudged them into the corral. Gauchos also dress with a lot of flare. The beret is de rigeur. In the rain they wear leather capes. I am preparing to mount my steed. His name in Spanish meant, I concluded, “Staller.” Whenever we came to a raging glacial strea, he refused to cross, no matter how hard I kicked and yelled AIII! 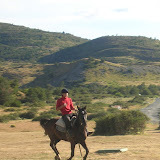 (Giddy-up), until Augustin, our gaucho, held up his whip and said something in Spanish. My horse then decided he had meant to cross all the time, and was simply contemplating the beauty of the landscape. My wife’s horse had a named that sounded like Mordrador, which she suspected meant Biter. Hers was a talkative horse, and had a long conversation with her about how hard the life of a horse was on the Estancia Cristina. Her horse also did something we had never seen before. We came to a stream, very near our rooms, and in the bed were extremely fresh puma tracks. Her horse took one look at the tracks and walked backward up the bank. 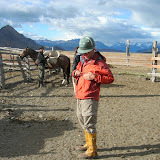 I was not very happy myself, as I had been wandering alone around the estancia the previous day. We were assured that only very few tourists had ever been eaten by pumas.